Claire Monteleoni is an Assistant Professor of Computer Science at The George Washington University specializing in machine learning. Her biography bristles with terms like “spectral clustering,” “computer vision” and “matrix completion,” the sort of jargon better saved for the tortured exposition of a pulpy science fiction flick. However, Dr. Monteleoni’s work on machine learning is no fiction – and it may help preserve our way of life. First, let’s talk about machine learning. Far from whatever Asimovian horror you might be imagining, machine learning simply describes an automated way to find patterns in data. Amazon uses machine learning to suggest items based on the purchase histories of other customers. The online giant sees you shopping for tortilla chips and remembers others who purchased tortilla chips also bought salt, limes, tequila and aspirin and suggests you put them in your cart. Dr. Monteleoni uses machine learning to track climate models. She is building the new field of “climate informatics” (a term she coined). 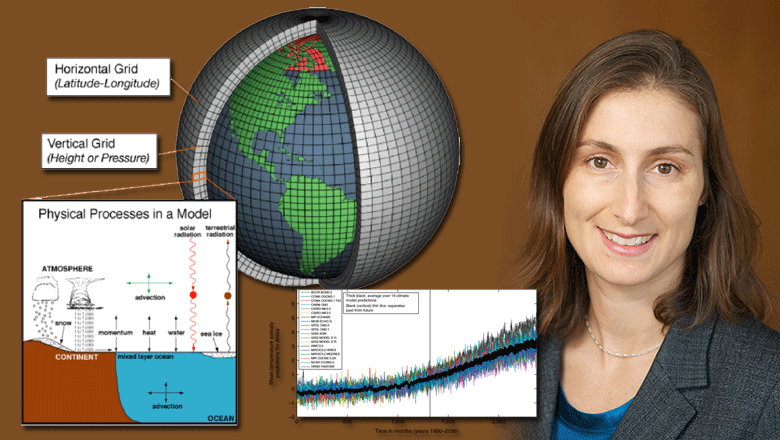 In 2011, Dr. Monteleoni co-founded the Climate Informatics Workshop with NASA climatologist Gavin Schmidt. The Climate Informatics Workshop brings together climate scientists and data scientists to improve climate change prediction. “Hopefully, we’ll do for climate science what bio informatics did for various fields of biology,” said Dr. Monteleoni, “which is to bring in all these cutting-edge data analysis tools to whatever problems are currently in climate science, especially with respect to climate change prediction.” Currently, Dr. Monteleoni is using machine learning to help improve predictions made by the UN Intergovernmental Panel on Climate Change. The IPCC uses an average of several climate models to make predictions about climate change. Each model is a computer simulation that projects how the climate will behave in the future. The models differ on some internal assumptions, so while they generally agree in the short term, they disagree more and more as time goes on. The average of all these models makes pretty decent predictions, but the system is far from perfect. The central dilemma is that not every model performs equally well. Imagine, explained Dr. Monteleoni, that you have invested the same amount of money in each of several stocks. As weeks and months go on, you notice one or two stocks performing better than all of the others. At that point, you want to move your money from the underperforming stocks to your winners. Dr. Monteleoni is doing something similar with climate models, using machine learning to determine which models are performing best and weighting them accordingly. The solution may come through something called sparse matrix completion, a tool with a range of applications. Netflix, for example, could use sparse matrix completion to make predictions about what movies you’ll like based on the ratings of other users. As the service offers countless movies, and the typical user has only seen and rated a few of them, data are in short supply. Explained Dr. Monteleoni, “You put together this matrix where you have all the users that have ever rated things on Netflix and all the movies, and then by looking at things jointly, you hope to be able to fill in some of the missing data.” For example, you might find that users who watch horror movies also like strong female leads. Climate scientists could use sparse matrix completion to fill in missing data about the Earth’s temperature in the past. Tools like this could help preserve our way of life. If we know what to expect from climate change, we can adapt before it’s too late. Dr. Monteleoni wants to understand how climate change will affect climate extremes: extreme storms, droughts and cold spells. “Is the variance of temperature going to go up so that we have colder colds and warmer warms?” Knowing the answer will help us prepare for the worst. Jeremy Deaton is a Master's student in Media and Public Affairs at The George Washington University. Climate model schematic at top left courtesy of NOAA.